Weaponizing books no longer seems like an appropriate metaphor, but the role of books cannot be underestimated. Literature has always played an important role in revolutionary upsurges, both as analysis and providing visions of a new society. The writings of these classic anarchist greats seemed to work for him as analysis and vision which propelled him into action to bring about a revolution that would embody them. Tony and other comrades in the great age of revolutions against capital between 1848 and 1939 may have only needed that short a book list since the workers then did not need print to remind them of their onerous state in life to urge them onto rebellion. Today, capital has triumphed in a manner unanticipated by earlier revolutionaries who believed the new world they carried in their hearts was close at hand. Now, books take on a greater role in lives that look for social change. We need them to understand the forces of capital, its economy, culture, and administration; we need writing to know that we are not alone, that the spirit of rebellion and refusal to submit exists in movements and by individuals everywhere, and we need them to remember the comrades who came before us, their courage, their vision, and their determination. Also, to enjoy the pleasure of holding a book filled with a good story or poetry, or one that makes us laugh. To get away from the electronic screens which dominate our lives. 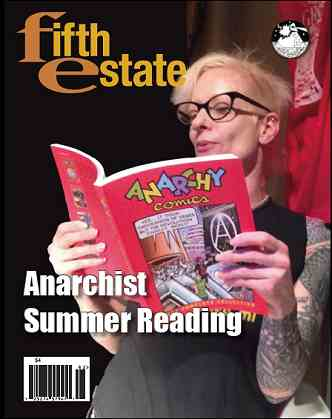 To that end, we are publishing this Anarchist Summer Reading edition. Something we haven’t done since 2012. Someone noted how many reviews we have. Actually, what is printed here doesn’t even come close to the number of anarchist-themed books that deserve review and reading. Find them through your independent publisher and bookstore!